The Little Room is described in detail in Dr. Nielsen's book, Space and Self. It is a piece of equipment that provides students with a safe environment for independent play and exploration. Many children are more willing to tactually explore objects when they are in control of an activity and can anticipate what might happen. The Little Room is one of the many pieces of Perceptualizing Aids that can be used to help a learner develop the ability to reach and grasp. Other equipment includes include the Activity Wall, Echo Bucket, Mobile and Scratch, Position and Grasp/Grab Boards. Dr. Nielsen tried several designs for the Little Room before settling on a design that provided an environment to make use of both auditory and tactile feedback as well as durability, safety and proper ventilation. For this reason we do not advocate making home-made Little Rooms. Little Rooms can be configured to adjust height for individuals who can sit unsupported. They can also be re-configured to adjust for individuals who are tall. Lilliworks sells them in various packages. What Is the Purpose of a Little Room? Dr. Nielsen designed the “Little Room” to give blind infants, children with slow development, children with severe disabilities and children with combinations of disabilities an opportunity to gain the ability to reach, to begin to understand space, and to develop early object concepts. Typically developing children reach for objects when they are 3-4 months old, while children with blindness often are 10-12 months old before they achieve this ability. Some children who are blind develop a stereotyped motor behavior focused on their own body, instead of developing reaching behavior. This is why it is important to develop an environment which motivates the child to reach for objects as early in life as possible. How Big Should the Little Room Be? The size of the Little Room depends on the size of the child. It is important for the child to be able to touch the side panels and the ceiling as well as the objects hanging in the Little Room. LilliWorks currently sells three different sized Little Rooms which allow different configurations depending on the size of the child and whether or not the child can sit up inside without support. For children who cannot sit up the Little Room is typically 1' high. If the child can sit up, it is configured at 2' generally, though for older individuals it can also be configured at 3' high. When the child begins to reach for the ceiling and the walls you can make the Little Room bigger. That way he or she is motivated to move around in the Little Room and/or go in and out of it. This helps the child have the experiences and understanding of space that typically developing children achieve by looking around and by building dens and playhouses. Children who are blind, especially those who are also severely disabled, are not able to build playhouses by themselves or to find small spaces under furniture and in cupboards to play. Creating and playing in these small spaces is an important feature of a typically developing child's experience. The objects that hang from the ceiling and/or upon the walls of the Little Room must be positioned so whatever movements the child can make produces tactile contact with the objects. It is a good idea to observe which qualities the child prefers in the objects that are used – which part of the Little Room the child prefers to search – which sounds and smells the child prefers. It is very important that the “Little Room” is equipped with many objects so the child can compare different tactile and auditory stimuli. It is also important that the child can reach the objects so they must be graspable. The little room can be configured in many sizes to meet the needs of individual learners. Little rooms configured to 1' high should be used for learners who cannot sit independently. (The design shown to the right is configured to 2'x2'x1') When possible, the short little room will be configured to a 4'x'2'x1" design, so that objects can also be positioned over the legs. A resonance board is placed under the little room so that the learner's activities echo and vibrate in the acoustic environment. Ordering information is available from LilliWorks. The tall Little Room is designed for learners who can sit independently. It's height can be changed to meet the needs of the learner using it, and should start at a minimum height of 2'. (The configuration to the right is 3' in length, 2’ wide and 2’ in height. For adult learners, the same Little Room can be changed to the configuration of 2' in length, 2' wide and 3' in height. (It is important that learners who cannot sit use the short little room.) A resonance board is placed under the Little Room so that the learner's activities echo and vibrate in the acoustic environment. When possible, it is best for each learner to use their own individual Little Room lid. This allows the items provided to meet the developmental needs of the learner. This also addresses concerns about germs. While having individual lids may be ideal from an educational and therapeutic perspective, they do take up quite a lot of room. It may be helpful to optimize storage by building customized shelving to organize the lids and keep them safe and separate. Objects that are selected to be used in the Little Room should be graspable or allow the child to entangle his/her fingers in to pull or bring to his/her mouth. If the child is unable to grasp the object, objects should produce some sound if the child pushes on it with head, hands, feet or legs. The objects should also have an interesting variety of tactile, auditory and/or visual qualities that will arouse the child's curiosity to encourage exploration and learning. The objects in the Little Room are attached with elastic and so they will return to their original positions when the child lets go of them, enabling him to find them again and repeat an action as quickly and as often as he wants. It is important to cover the elastic with protective tubing, so that fingers do not become entangled in the elastic. The Little Room comes with a variety of side panels. Which panels are included when configuring the Little Room should be guided by the child's preferences and motor skills. Other attachments can be used to place objects near feet and legs. The Little Room should be used in conjunction with a Resonance Board. Providing sets of objects like measuring spoons and cups, provides the child an opportunity to work on number concepts (one, more than one) and/or size concepts (big spoon, little spoon). Hanging similar objects together allows for comparison (metal spoon, plastic spoon, wooden spoon) of things that are alike and different. We encourage you to read Space and Self to get ideas about objects to use and how to think about setting up the Little Room. See also Points to Consider When Choosing Materials. The Little Room provides an environment which gives students the opportunity to work on object exploration and manipulation, object comparison, object permanence, cause and effect, spatial concept development, problem solving, independent play, recognition, anticipation, sensory integration, and spatial memory. The Little Room also provides the opportunity to learn about the different materials from which objects are made (paper, leather, wood, metal, etc.) and the different attributes of objects (size, weight, temperature, etc.). As learners experience these different objects and learn about their specific characteristics, they will discover that some objects are better for some activities than others. They will learn that some objects make better sounds when batted at than others, some are better for mouthing, some are more interesting to touch, etc. How Do I Put a Child in a Little Room? Click to open PDF of how to put a child in a Little Room. Below is a short video showing a young boy using the Little Room. Description: Demonstration of the "perceptualizing aids," Little Room and Resonance Board. Description: Child seated in a Little Room. 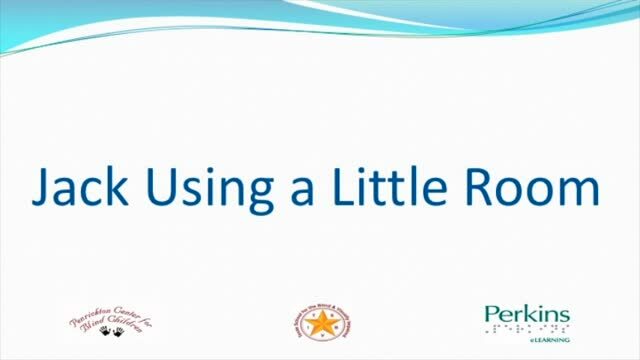 Learn more about the Little Room, including where to purchase one. A parent shares the story of her daughter and the Little Room.